Have a question? Below are the answers to our most commonly asked questions. If you don't see an answer to a specific question you have, please feel free to email us directly at: info@salutetospouses.com. To be considered for the Salute to Spouses scholarship you must first and foremost be a spouse of an active duty military service member. Please submit a copy of your spouse’s orders (which will indicate active duty status), a copy of your marriage certificate, a high school diploma (or equivalent) and have access to a computer or internet as the scholarship is for online students only. As part of the application, you will also need to submit a written essay. Students may work on their degree part time or full time. Scholarships will be given out in increments of $600/$1,200 per semester based on enrolled status (full or part time) for a total award of $6,000. The Salute to Spouses scholarship offered by Bryant & Stratton College Online, awards spouses of active military members up to $6,000 in scholarship money. Students may work on their degree part time or full time. Scholarships will be given out in increments of $600/$1,200 per semester based on enrolled status (full or part time). The Salute to Spouses scholarship can only be used towards a Bryant & Stratton College Online education. Yes. The Salute To Spouses scholarship is only available to students who want to attend any of Bryant & Stratton College's 15 online degree programs. The flexibility that online degrees offer the busy lifestyles of military families is a great match. You can do your classwork when it's convenient for you. Visit http://online.bryantstratton.edu for more information about the college. Yes! We encourage you to research all private and government financial aid programs to maximize your financial aid assistence you can find. Please visit our Financial Aid section for more information. Yes, the current scholarship program is only offered to spouses of active duty members of the United States military who are serving, and must be serving in the Marines, Army, Navy, Airforce, or Coast Guard. Sorry, the Salute To Spouses scholarship is currently just for married spouses of active duty military members. Yes. Scholarship recipients must maintain a GPA of 3.0 and must stay enrolled semester-to-semester. The site was launched in April 2011 but is a culmination of months of researching, planning, interviewing, writing and editing. We understand the commitment that you make being married to a member of the military. The mission of the site is to provide an education portal and source of online information for military spouses by featuring personal stories, resources, advice, tips, and opportunities for community discussion. Salute to Spouses.com is not endorsed nor sponsored by any military affiliation. No, your information here is safe. Bryant & Stratton College will never share any of the information you provide with third party affiliates. In order to participate in the forums , you must first become a member of the community. Once you have joined the community you will have the ability to post threads and comment on discussions, as well as blogs. To start a new topic in one of the forums, simply click on the Start New Topic link, you will be brought to a form that allows you to write a title for your post, and an area for body copy to write what you want to say. It's easy! Once you've become a member of the community you will be able to setup your user profile. There is a link to Edit Profile in the blue box atop each page (when you're logged in). Open your profile page and you'll see the area with an option to upload a picture. Use the browse button on the profile page to select the image you wish to display. This picture will be visible on your profile and as a thumbnail when you comment or participate in a forum. Please contact info@salutetospouses.com for help with any site problems or questions you may have . 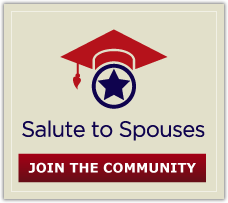 As a member of the Salute to Spouses community you will have access to participate and comment in all of the forums and blogs, on a variety of topics. You'll also be registered to receive our monthly newsletter that keeps you aware of new content that we've added to the site that month.